Ukip scored 3,881,099 votes in the 2015 general election. More than the Lib Dems and SNP put together. Its current poll rating, even leaderless in the lee of Theresa, mostly hovers in the 14% region. Last June, at Brexit time, it was five or six points higher than that. Without Ukip, Remain would have won. Editorialists talked obsessively, post-referendum, about the disaffected white legions of the north and Midlands in revolt against London’s elite. Yet where is that newfound extra-metropolitan fascination when Ukip makes its own top choices? At which point, a few corrective thoughts. First, whatever the state of Ukip’s internal affairs, the state of politics in both Europe and the US suggests that as economies and societies continue to fragment, and the mainstream seems to have no clear answers, the new rightwing populism is going be with us for some time to come. Second, given that the referendum happened only two months ago, it is worth at least briefly reflecting on the part Ukip played in the outcome. With a solitary MP and a flimsy activist base, it still played a huge role in embedding the connection between most of Britain’s ills and the EU, and thereby carrying its cause from the margins of politics to its very centre. Here is an example of postmodern politics from which people on the left would do well to learn. Moreover, the people responsible are hardly likely to simply disappear. Remember the Eastleigh by-election when the media were shocked that UKIP came so close to winning A LIB Dem seat that Cameron had hoped to bag for the Tories? Diane James certainly made an impression on me. For quite a while I had found myself in sympathy with UKIP on many issues but the quality of its leadership cadre before 2013 left much to be desired. Diane changed my perception of the party. As a new member I attended the 2013 party conference and discovered that quite a few other new faces felt the same way. Talking now to ordinary members it appears to me that at the grassroots level she remains very popular. However there is some evidence that amongst the old guard, the pre 2010 folk, she is perceived by some as “not quite one of us”, rather aloof and unwilling to socialise. Some of these are keyboard warriors who, I suspect, preferred the old days of obscurity and isolation when they could play out their fantasies of worldwide conspiracies far away from the media spotlight. If you want to go back to those times then Diane James is not your candidate. But if you want UKIP to tack on another 2/3m votes to the 4m of 2015 – and thus break into parliament – then she is the leader who can do it. So what do I know….lol….it wasn’t to be. Pity. “At a high proﬁle public event in Cambridge last week, I was asked why I had not completed the process to become Leader of UKIP? I had little option, but to give the truthful response that, although nominated Leader by popular vote in the membership, I found that I had no support within the executive and thus no ability to carry forward the policies on which I had campaigned. According to a whole range of media pundits (yes you, Benedict Brogan of the Telegraph) when I arrived at the South East England Regional Conference of UKIP in Eastbourne last Saturday the hall should have been almost empty with just about thirty party members wandering around all sad and miserable – dumbstruck by the massive Tory victory in the Newark by election last week…you know, the election where the Tories doubled their 16,000 2010 majority and UKIP got even fewer than the 1,900 they got in 2010. I had been told that the wheels had come off the UKIP juggernaut, the earthquake was now a squeak and purple was so…..yesterday. Clearly the People’s Army was, like Bonaparte’s in 1812, fleeing the battlefield in chaos and confusion. Yet when I stepped into the hall I found it packed out with a thousand members and the whole place buzzing with excitement. Far from an air of despondency everyone was eager to prepare for next year’s General Election and listened intently as Nigel Farage outlined the leadership’s plan to target those 30/40 key constituencies where UKIP had done exceptionally well in the local and EU elections. They were also pleased to hear that between now and September the party would be putting the finishing touches to its 2015 election manifesto and that the responsibilities of presentation would be shared out between UKIP’s 24 MEPs with Farage himself more “primus inter pares” than the dominant voice he has been up to now. We heard from new SE MEPs Diane James, Janice Atkinson and Ray Finch, people whose faces will become much more familiar as one part of this collegiate leadership cadre. Local councillors and party officials spoke about political issues, campaigning and branch organisation. UKIP’s national infrastructure is clearly becoming more professional, its message more consistent. 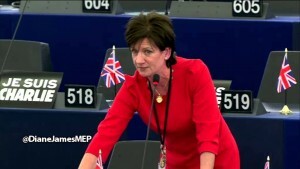 Diane James, in particular, got a lot of respect. She doesn’t do tub thumping but comes across cool, calm and measured especially under fire. She is a great asset for the party at a time when it needs to be taken more seriously. This was not a congress of the defeated – and why should it be? Those figures in the opening paragraph were figments of my imagination – just as the media’s interpretation of Newark was an expression of their wishful thinking. In this “safe” Tory constituency the Conservative majority was less than half the 2010 figure. UKIP’s share went up from 3% to 25%. They replaced Labour as the main opposition party and the Lib Dems evaporated. True we didn’t win the seat but away from the Cameron cheerleaders at the Telegraph and Spectator there was recognition that it was still a good result for UKIP. Ukip didn’t quite sustain their momentum from last month’s local and Euro-elections. But it was a good result, especially as Labour’s charge that the Tories threw the kitchen sink and more into the campaign is echoed by Nigel Farage, who will be studying young Jenrick’s election expenses carefully. The Tory money wall and Ukip’s inability to match it are two of the five shrewd reasons Sparrow cites on his blog for the likely outcome. Just consider this. In 2010 the Tory majority in Newark was 16,000 yet they were unable to gain an overall majority in Parliament. If the Newark 2014 pattern was repeated throughout Britain in 2015 Cameron and his mates would not have a snowball’s chance in hell of winning power in their own. That’s the real message of Newark – and this is why we departed Eastbourne in such high spirits…the Purple Revolution has only just begun……..